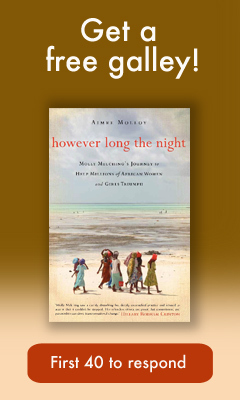 In her first full-length solo venture, Aimee Molloy (Then They Came for Me: A Family's Story of Love, Captivity, and Survival, written with Maziar Bahari) brings readers a beautifully rendered portrait of Senegal and its generous people, and of Molly Melching, the American who fell in love with both and dedicated herself to bringing them education on their own terms. Molloy's account of a modern-day heroine glows, and with precise, succinct strokes, she draws the reader into Senegalese lives. Melching came to Africa first as a wide-eyed college exchange student from Illinois. From the moment she arrived, Senegal became her second home, and Melching eagerly embraced the culture and language, falling particularly in love with the villages outside the French-influenced city of Dakar. Instead of racing back to America and modern conveniences like electricity and air conditioning after her term ended, Melching chose to remain in Senegal. Noticing that schools were teaching in French when children spoke the local language, Wolof, at home, Melching began to question traditional European methods of bringing education to the Senegalese. In time, her respect for the people and society led Melching to develop educational programs that considered what the Senegalese themselves wished to learn and imparted information in their native tongue. These empowering strategies were radical at the time, but within a decade Melching had piloted a fast-growing program called Tostan ("breakthrough" in Wolof) that brought villagers education, encouraged development projects and enhanced rather than hindered villages' communal self-esteem. What Melching didn't anticipate, what no one could have anticipated, was that Tostan held the key to empowering Senegal's women and ending the acceptance of a key piece of Senegalese culture: female genital cutting (FGC). When Molly Melching arrived in Senegal in 1974, women had suffered cutting for generations. Believing (incorrectly) that their Islamic faith required compliance with "the tradition," mothers subjected their daughters to the painful and sometimes life-threatening procedure not out of cruelty, but love. An uncut woman would never find acceptance within the community or make a good marriage, and no mother would set her daughter up for shunning. Perhaps most impressive is Molloy's ability to translate the philosophy of a cultural mindset so different from our own. Rather than paint the practitioners of FGC as villains and Melching as the Great White Hope who rescues the next generation of girls, Molloy makes certain to portray her realistically, as a facilitator of education. It is the female Tostan students themselves, armed with new knowledge about their bodies, human rights, and religion, who refuse to allow their daughters to suffer as they have suffered with FGC and the fear that admission of pain or doubt will bring scorn and dishonor. At the same time, these women as a group are a force of nature with the ability to change the fate of their nation's girls or close their eyes and continue to embrace a tradition that, while dangerous, carries the sanctity of generations of routine. This is their biography as much as it is Melching's, and the efforts of the first village to stop FGC attract unlikely allies. From a woman who quit her role as a traditional cutter and became an anti-FGC advocate to a respected elderly man who walks from village to village in the scorching heat to spread information about the dangers of FGC to a host of mothers and grandmothers, the Senegalese women, and some supportive male counterparts, show a compassion and concern for each other that transforms a country into a family. Rather than diminish Melching's importance, Molloy's holistic approach to her subject matter shows Melching as the pebble that began the ripples. The women of Senegal bring about the change, but without Melching and Tostan, they would not have known change was needed. In fact, the word tostan is a metaphor for this effect. Cheikh Anta Diop, a Senegalese professor and politician, told a young Melching, "Literally, the word means the hatching of an egg.... That chick becomes a hen and lays eggs... and so there are more chicks that become hens and the process continues for generations. For me, the word signifies the idea that as people gain new knowledge in a nurturing and environment they can then reach out and share it with others, who in turn do the same." 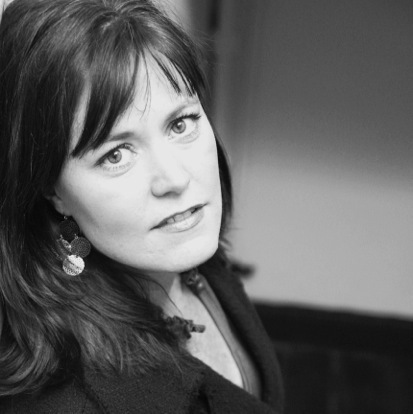 Aimee Molloy has collaborated on seven books, including Then They Came for Me: A Family's Story of Love, Captivity, and Survival with Newsweek journalist Maziar Bahari (to be a film directed by Jon Stewart), and Jantsen's Gift: A True Story of Grief, Rescue and Grace, with Pam Cope. She holds a B.A. from Duke University and an M.A. from New York University. She lives in Brooklyn with her husband and daughter. How did you become involved in telling Molly Melching's story? I first learned about Molly while reading Half the Sky by Nicolas Kristof and Sheryl WuDunn. In it, they highlight Molly's extraordinary work bringing education to girls and women in rural Senegal. At the time, I was researching an idea for a book about girls in the developing world, and I was taken by Molly's story. Also about this time, I received a call from Jeanette Perez, an editor at HarperOne. She was familiar with my work and told me they were interested in a book about Molly, and was I interested in writing it? It honestly felt like fate had intervened. Molly and I decided to meet in Philadelphia, where she was attending a conference, and we had an immediate connection. A few months later, I was on my way to Senegal to observe Molly's work firsthand. But I knew from our first phone call that she was a woman that the world needed to know about, and that I wanted to be the one to tell her story. When approaching a long-form narrative like writing a book, an author has to make some key decisions in how the story will be told, as far as perspective. I decided early on that one of my goals in writing the book was to not only tell Molly's story--how a single mother from Illinois came to effect such significant change in Senegal--but also to paint a vivid picture of what life is like for women in rural Senegal, and to make the book be as narrative and engaging as possible. Therefore, I spent most of my time in Senegal in small villages, getting to really know the women who are leading the movement to end the practice of female genital cutting, experiencing life as they do. It was truly amazing. I got to know dozens of extraordinary women, like, for example, Oureye Sall, a former cutter who became a leader in the movement to end FGC. We spent hours together in her home, discussing her life, and her experience as a cutter. Many people who've read the book have said that it reads like a novel, and that they have a hard time putting it down. I'm always so happy to hear that, as it was exactly what I was after when I first began writing. Molly Melching celebrating with the women of Malicounda Bambara on the 10th anniversary of their decision to abandon FGC. Photo ©Tostan. What lessons do you think Molly and Tostan could bring to the rest of the world? One of the most extraordinary things about Molly is her cultural sensitivity. She's lived in Senegal since 1974 and truly has become a part of the culture. She is fluent in Wolof, the predominant local language. She dresses as the Senegalese do. She is deeply respectful of Senegalese traditions. And she brings this worldview to her approach to development, to every way in which Tostan is run. This, I believe, is why she has had such success in her work. She never imposes her own ideas on the Senegalese. She never thinks that she knows better than the people what changes they require. I've seen how this attitude has led her to be embraced by people in the villages of Senegal, leading them to trust her completely. I think anyone who is interested in development, or in helping to bring about positive changes in the developing world, can learn a lot from Molly's example. In fact, I would argue that Molly's approach to development--one that embraces the local culture, is borne from understanding--just might be the single most effective way to approach development. In However Long the Night, you show that the issue of female genital cutting is not as black and white as we in the West assume. The issue of female genital cutting is a complicated one. As a woman, a mother and a feminist, I can understand why the topic often evokes anger and disgust among women in Western cultures. I have felt that in the past myself, because it really is horrible to think about what girls are made to endure, in the name of tradition. But as readers of However Long the Night will learn, many of our assumptions about the practice are wrong. It is not a tradition borne from men's desire to control a girl's sexuality or to oppress women. The truth is that the tradition is one that is perpetuated by women themselves, and women do it in order to create a better future for their daughters. Because choosing to not cut one's daughter would be setting her up for a future of social isolation, it is in many way's a mother's greatest act of love. So regardless of the feelings we might bring to this issue, sensitivity to this reality must be part of any discussion about FGC, and certainly in any efforts to bring an end to the practice. After all, there are plenty of examples where attempts to approach the issue in other ways--using tactics meant to shock or shame those who practice it--have not worked. 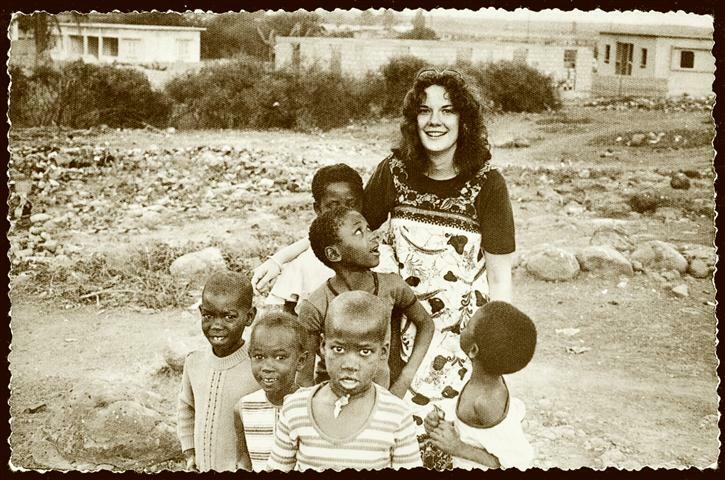 Molly in Senegal in 1976 with children from the Démb ak Tey Center. Photo courtesy of Molly Melching. As a woman and mother, how does the story of Tostan affect you? Well, I became pregnant and gave birth to my first child--a daughter--in the course of writing the book. When I first discovered I was pregnant, I was worried that the experience would make the project more difficult for me. And while there were certainly challenges--travelling while pregnant, scheduling time to write after the birth--in the end, becoming a mother really informed my work in a beautiful way. I began to think about mothers and daughters a bit differently, understanding fully what a strong, powerful connection this is. This helped me to better understand and appreciate how so many women in Senegal were able to risk so much--being ridiculed and ostracized by their communities--to ensure the health of their daughters. As one woman in a village explained to me, once she understood that this deeply entrenched and revered practice could potentially hurt her daughter, nothing was going to stop her from helping to bring about its end. Have you got another great project lined up?